Sails, if not used on a boat, can be stretched to cover your patio. It’s low cost and it comes in a wide variety of colours, so feel free to choose one which complements the environment and your space’s design. Of course, you have to make sure that the size of your sail covers much of your outdoor space. It can stay up all year round, but take it down when heavy snow starts to fall. Designer tip: Choose sails with UV protection, waterproof, and windproof properties. These are heavy duty and needs a stronger anchorage to keep it steady. 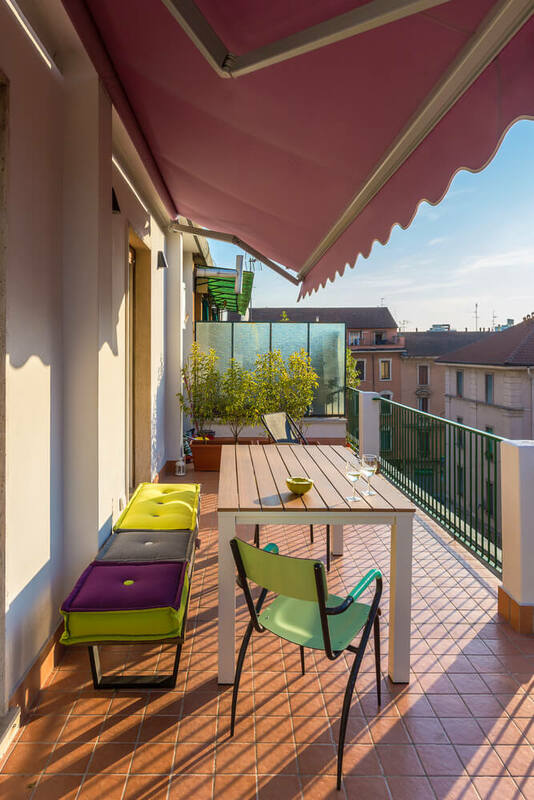 As designers, we highly recommend a retractable and waterproof awning in your outdoor areas. It’s flexible: you can lay it when the sun or rain is too strong or fold it back when the weather seems fine. Designer tip: If budget is not an issue, a motor controlled retractable awning is a great home addition. Otherwise, use a hand crank but keep it out of children’s reach. 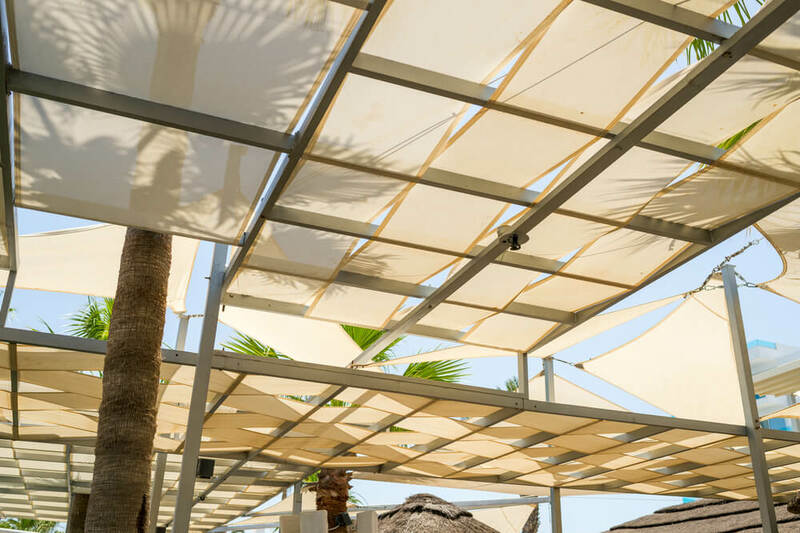 Supported by a stable structure, a sun shade fabric stays still above your outdoor living or dining areas. The fabric filters light and reduces glare without disturbing the natural wind movement. With the right fabric, sun shades will not darken your deck. 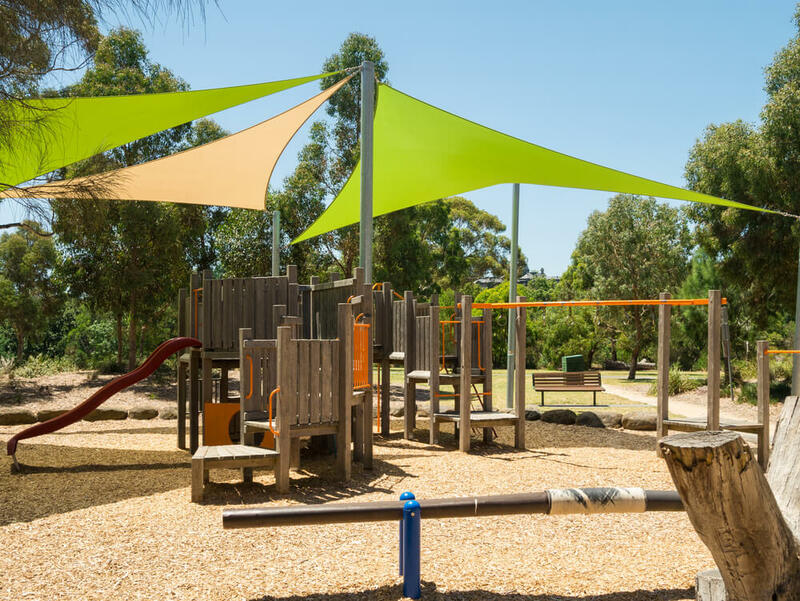 Similar to sun shades, a sliding wire shade or outdoor canopy needs at least four strong poles for support. Here, you are in control of the shade’s coverage. All you need to do is to slide the shades along the steel cables until you reached the desired look. This one is a fuss-free option for your outdoor living and dining areas. Imagine having full sun and rain protection with one touch of a button—easy, right? Unfortunately, being able to regulate all the elements comes with a hefty price tag. 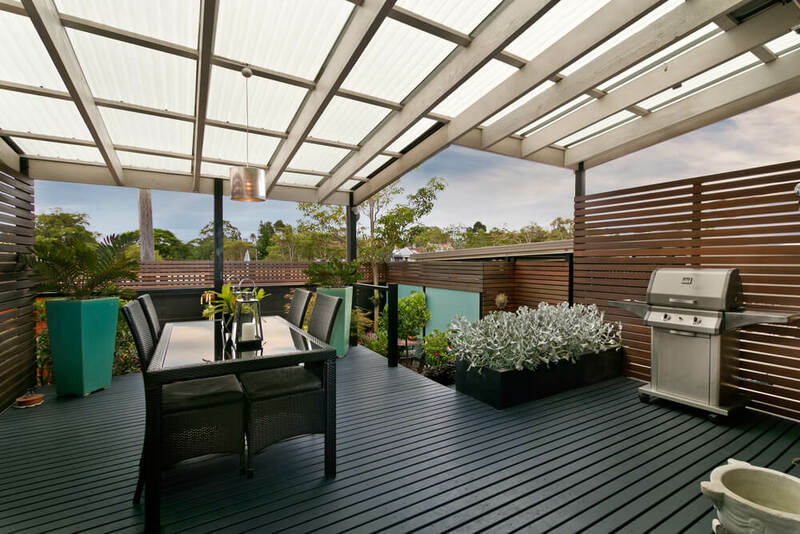 Designer tip: Go for electronic louvres with built-in rain detectors. You’ll love how the blades close automatically, protecting all your outdoor furniture while you’re away. 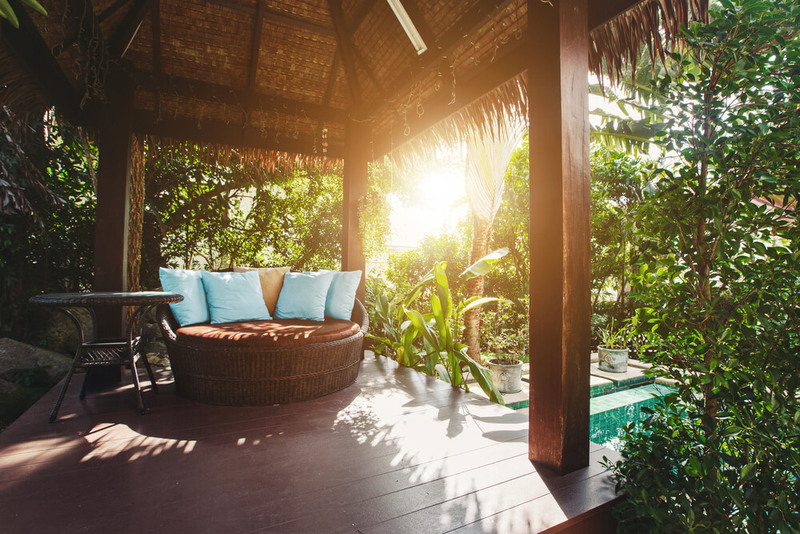 Pergolas are one of the most popular outdoor shade choices in the country. It’s an easy building project and can be personalised to complement the architecture of your house. Talk to your architect regarding building Corinthian, Roman, or Japanese-styled pergolas. Using plants to create shade is cost-efficient, environmentally-friendly, and undeniably lovely. Setup a structure such as a lattice or an arbour and let vines and climbers grow overhead. Up for something dramatic and artistic in your outdoor living and dining areas? The laser-cut metal screen might be for you. However, the screen’s busy design might cast a distracting shadow in your space at noon. This outdoor shade fits most contemporary homes in the country. 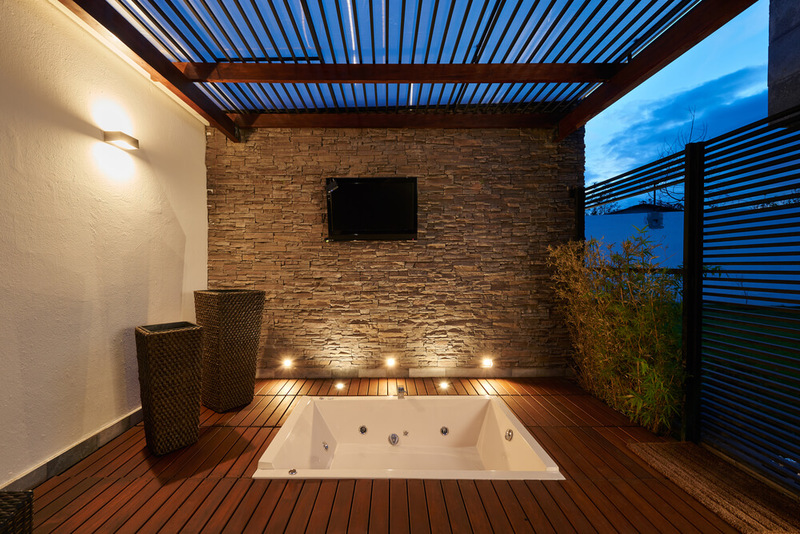 It’s sleek and can be integrated easily in your property. Only use durable wood that’s certified by the Forest Stewardship Council (FSC). If you want something that lets the light in but keeps the rain out, the corrugated polycarbonate roofing will work for you. It comes in transparent and tinted glass. Opt for the tinted one for better sun protection. 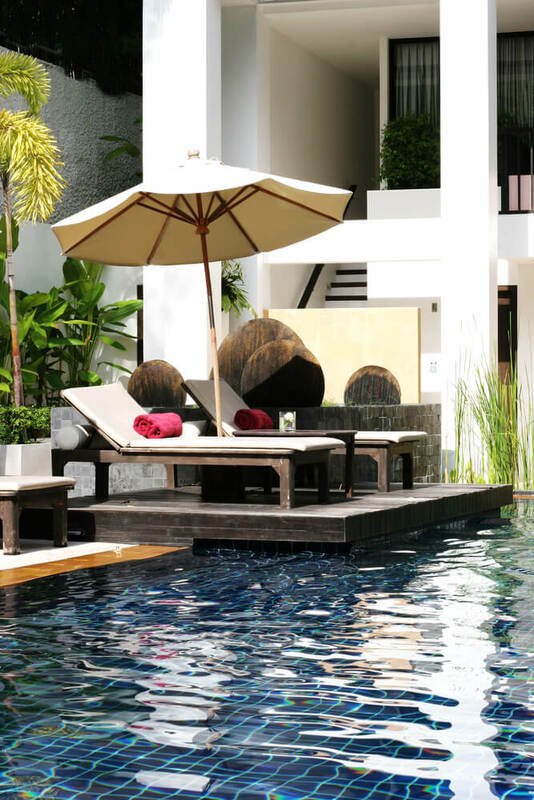 This is perfect for seating areas beside the pool. Pop an umbrella to give you a temporary shade. Attach your umbrella’s pole to a solid base to help it withstand the winds. Thatch roofing is a great addition to your pergola. It’s low-maintenance, long-lasting, and the tropical look can blow all your stress away. Decorate it with lights and outdoor lanterns.